Over the past 2 years, the Jerusalem Unity Prize has been awarded to outstanding ambassadors of Jewish unity throughout the world. Each of them has, through passion, commitment, consistency and hard work, contributed to our goal of fostering unity throughout their Jewish communities, both in Israel and in the Diaspora. 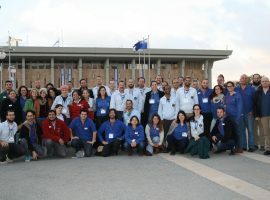 The Global School Twinning Network provides Jewish schools with living Israel connections; changes the way Israelis perceive the global Jewish people; encourages professional exchange between teachers; and builds real-life bridges between our global Jewish family. Through the Network, each Israeli school is “twinned” with a Jewish school or Hebrew school overseas. Many “twinnings” have been active for two decades; the Network was officially established in 2011 on the basis of many years’ expertise. In just three years, the Network has doubled in size and now includes 600 schools (300 “twinnings”) – and is growing fast. The schools are located on six continents. Hebrew and English become living languages as students engage in joint projects and experience their Jewish education through a new, wider lens. 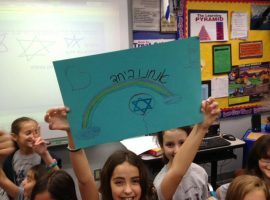 They explore issues of Jewish and Israeli identity through video conferences, shared projects, exchanges of letters and crafts, pictures, videos, and trips to each others’ schools. Bnei Akiva and Hanoar Haoved V’halomed are two of the three largest youth groups in Israel, and their world views are significantly different from one another, both culturally and politically. The joint activities serve to create direct and significant meetings between the groups. By learning together, each movement learns about the other. Thus far, they have focused mainly on identifying the points of agreement between the movements, and strengthening them in order to translate them in to meaningful, joint, far-reaching actions. The belief is that the strengthening of ties between the movements will reach all their members, even those who are not directly involved in the initiative. Kesher Yehudi aims to strengthen the Jewish people from the inside by reducing the hatred and alienation between the various sectors. Their vision is to utilize the ongoing friction of Jews from all over the religious and social spectrum in this small and crowded country to enable people to really get to know one another. This serves the dual purpose of exposing news audiences to the spiritual treasures of the Jewish people, as well as imparting to the religiously observant Jews a reminder that they are not the sole custodians of the Torah. The Hapoel “Katamon” Jerusalem football club was founded in 2007 by a group of supporters of the Hapoel Jerusalem football team. The club has an active and unified fan base, and unlike other clubs, is directly funded by its supporters. 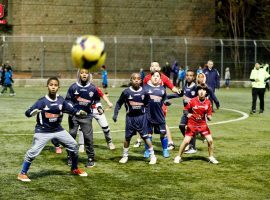 In addition to being a regular football club with adult, youth, and child teams, the Hapoel “Katamon” Jerusalem football club operates many social enterprises in Jerusalem that use football, and its popularity, as a platform for social change. Over 1000 youth from all segments of the population – Jews and Arabs, men and women, religious and secular – are actively involved in the educational programs run by the club, aimed at promoting coexistence in Jerusalem. In the famous-to-backpackers neighborhood of Khao San Road in Bangkok, Thailand, there is a welcoming place where Jewish travelers congregate to share meals, prayers, and a feeling of being home. 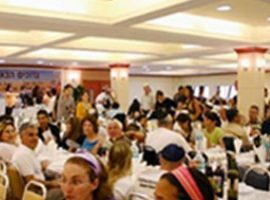 Run by Rabbi Nechamya Wilhelm, the Chabad House of Bangkok offers free meals, free phone calls, and free Internet to any Jew in need, regardless of where he comes from, his level of observance, or whether he practices at all. But more than the gratis perks, Rabbi Wilhelm offers a place where weary Jewish travelers from across the globe can connect and experience the feeling of unity and acceptance under a singular commonality. Rabbi Wilhelm welcomes Jews of all nationalities and religious backgrounds with open arms and demonstrates a warmth of spirit which only comes from the knowledge that every Jew is a brother or sister. Chabad of Bangkok lives the credo: Every Jew is welcome, as every Jew is family. 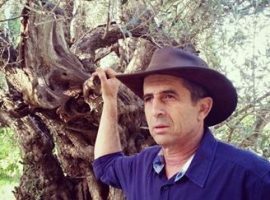 Since its inception 10 years ago, Nifgashim BeShvil Yisrael has facilitated almost 50,000 people of all backgrounds, nationalities and belief systems to hike the length of Israel Trail. While discovering picturesque Israel, program participants do not merely experience breathtaking scenery. The idea is to journey together in memory of those who gave their lives for the Jewish people, including both soldiers and terror victims. 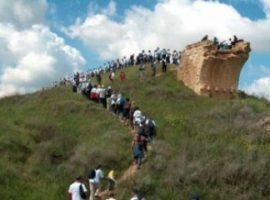 The joint initiative of Tsav Pius (of the Avi Chai Foundation) and the Ofner family, who lost their son Avi in a 1997 army helicopter crash, Nifgashim BeShvil Yisrael invites people of all religious backgrounds, from any age and across every socio-economic demographic, to walk together and learn from each other. It encourages hikers to engage in dialogue about the fundamental issues and challenges faced by Israel today – challenges which can only be conquered as one people working together toward a common goal. 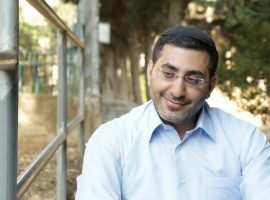 A graduate of both an Ashkenazi ultra-Orthodox yeshiva and the Mercaz Harav Yeshiva, Harav David Menachem, or Chacham David as he is known, serves as the Rabbi of the Mishkan Yosef community in Jerusalem. But it is primarily his gift as a singer and composer that he uses to bring people together. He is a great believer in the power of music and playing instruments to foster an appropriate atmosphere for peaceful encounters among believers. He frequently performs with Muslim musicians and works to bring together Jews and Muslims through music.